Balasana, which literally means "Boy's Pose," is most commonly referred to as "Child's Pose." It provides a gentle stretch to the back, shoulders, legs, and feet while allowing you to rest in a place of calm and peace. It's a posture that you can assume whenever you need to rest and relax—not only during your yoga practice session, but also at any time during a stressful day when you may need a bit of time for yourself. Following are step-by-step instructions for entering into Child's Pose. Come to a kneeling position on the floor. You can either keep your legs close together or let your knees and upper legs spread out to the side as the big toes of your feet come together behind you, the top surfaces of the feet in contact with the floor. As you exhale, allow your upper body to fold down over your thighs, forehead resting on the floor. If you can, let your buttocks rest securely on the heels of your feet. If not, let your buttocks rest gently raised off your heels, yet as low to the ground as possible. Stretch your arms out in front of you. To achieve a long, full stretch for your back and shoulder area, walk your fingertips forward until you feel a stretch along your entire back—from the base of your neck, across your upper and middle back, all the way down to your tailbone. Rest like a little boy. As a variation of Child's Pose, you can also try bringing your arms down alongside your torso, palms facing up (see Fig. YPS. 2b). The placement of your arms and hands may help to relax the shoulders and back. Feel the area of your lower back widening and expanding in this variation of Child's Pose. Feel the area of your upper back and shoulders widening simultaneously. See if you can rest your buttocks even closer to or on your heels in this variation—you may find a pleasant deepening of the release and stretch in your lower back as you do so. As an additional variation, you can experiment with making a "pillow" out of your hands to support your neck and head. Place your hands one on top of the other, palms facing down, under your forehead. Keep your buttocks positioned toward your heels while you allow your neck and head to relax. Stay in any variation of Boy's or Child's Pose you choose for as long as you feel you need to. Breathe slowly, deeply, fully and rhythmically. Allow the breath to circulate throughout your entire body. 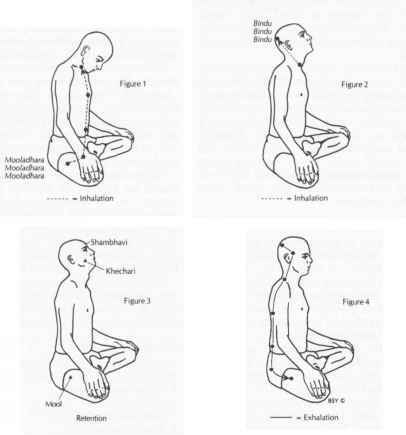 Feel yourself relaxing and releasing even further into the posture with each breath. Holding this position for half a minute to several minutes can be deeply calming and restorative.